Dan Larson is an aggressive, experienced and highly skilled trial attorney who has limited his practice to representing Plaintiffs in catastrophic catastrophic personal injury and wrongful death cases. Mr. Larson specializes in matters involving serious personal injury, medical malpractice, nursing home abuse and neglect, products liability, premises liability and commercial litigation. Over the last 25 years, Mr. Larson has successfully obtained numerous multi-million dollar verdicts and settlements on behalf of clients he has represented throughout the State of Florida and South Carolina, as well as other jurisdictions. Mr. Larson is AV “Preeminent” Rated by Martindale-Hubbell, receiving the highest possible rating for legal skills and professional ethics from judges and other colleagues. 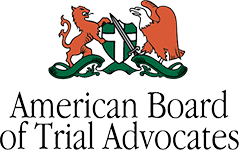 Mr. Larson is a member of the very prestigious American Board of Trial Advocates, an invitation only national association of experienced trial attorneys and judges who have demonstrated exceptional skills and professional ethics while successfully serving as lead counsel in numerous jury trials. 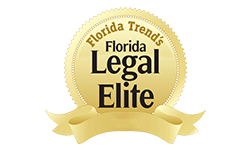 Mr. Larson was featured on the front cover of Florida Lawyer Magazine, and is consistently recognized as one of Florida’s Legal Elite by Florida Trend Magazine. He was selected as a “Super Lawyer” evidencing the highest degree of peer recognition and professional achievement. 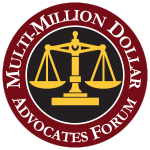 In addition, he is a member of the National Trial Lawyers Top 100 Trial Lawyers in the practice area of Civil Plaintiff law. 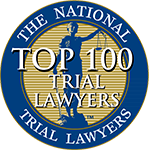 Membership in the Top 100 Trial Attorneys is exclusive and extended only to those individuals who exemplify superior qualifications, trial results and leadership. Mr. Larson has also been named as one of Tampa Bay’s Top Lawyers and Tampa Bay’s Legal Leaders by the National Law Journal, and is a member of the Million Dollar Advocates Forum, the Multi-Million Dollar Advocates Forum, a Fellow of the Southern Trial Lawyers Association, and a member of the Florida Bar, the South Carolina Bar, the American Justice Association, the Florida Justice Association, the Hillsborough County Bar Association, and the Tampa Bay Trial Lawyers Association. Dan Larson is a founding member and partner of the prestigious AV Preeminent Rated litigation firm of Larson Johnson, P.L. Both Mr. Larson and his law firm are consistently recognized in the Bar Register of Preeminent Lawyers, a distinction earned by fewer than 5% of all lawyers and law firms and is considered among the most respected lawyers in the country. Mr. Larson earned his Bachelor of Science Degree from Florida State University in 1985 and his Juris Doctor Degree from University of South Carolina School of Law in 1988 where he was recognized as a Trial Advocacy Champion and represented his law school at regional and national trial competitions. Mr. Larson obtained valuable experience as a litigator and became a partner at Fowler, White, Gillen, Boggs, Villareal & Banker, P.A. before becoming a shareholder in the prestigious South Carolina Plaintiff’s litigation firm of Svalina, Richardson & Larson, P.A.. Before founding Larson Johnson, P.L., Mr. Larson co-founded the law firm of Vaka, Larson & Johnson, P.L., a Plaintiffs Trial and Appellate Firm. Mr. Larson is a highly qualified and respected trail lawyer who focuses on catastrophic personal injury and wrongful death cases. Contact Larson Johnson, PL online or call 813-228-6688 today for a free initial consultation to find out how he can help you obtain compensation for you losses.